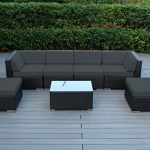 The Merax 7-Pc Rattan Wicker Patio Bar Set is a glass-topped table with 6 beautiful black resin stools. It comes with comfortable cushions of creamy white to offset the lovely color of the wicker. This is a wonderful addition to your outdoor space. Whether you want to purchase this for a special event or for all your family gatherings, it has a small footprint with lots of space for guests. The 6 stools included with this bar set can nest under the bar table quite easily. They can be stored in that manner to keep them from sitting in the elements. The cushions will be protected when they’re under the bar top, too. It’ll help save space to have the bar stools under the table when they’re not being used. Some people might even be more comfortable using this as a stand up bar where guests can lean on the table instead of sitting on the bar stools. The bar stools have a heel rung on the bottom of it. Your guests can rest their feet on it. It acts as a stabilizer for your stools, though. 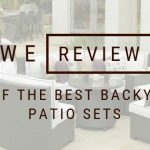 The entire bar set – the bar table and the 6 stools – are easy to move around the backyard as needed. If you want to use the bar and stools on the patio, they’ll be a great addition. They can also be moved to other structures. If you’re having a party with a tent, the bar and stools can simply be moved to the tent. You don’t have to buy more furniture for the event. The bar stools are padded for the comfort of your guests. 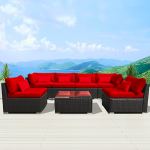 Instead of a plain resin wicker material, the padded cushions provide more comfort and style for the bar set. The cushions are thick enough to provide a cushy place for all the tushes that will be at your next party. They tie down onto the bar stool, so they can’t fall when guests climb up and down from the stools. The cushions can be stored in a box on the patio when they’re not being used, too. It will keep them in good condition. The resin wicker construction is durable and able to withstand any abuse the weather can throw at it. It’s durable enough for guests who might sit around drinking and lean on the table top, too. The bar stools have a resin wicker weave that provides extra-sturdy weight absorption. With regular resin furniture, you’re not getting a strong weave that will hold up the bottoms of all your guests. Resin is a terrific material for outdoor furniture and wicker is incredibly popular, too. Under the sturdy resin wicker design, there’s a steel frame that holds the entire structure together. The chairs and the table have a structurally sound steel frame to ensure that while the table and chairs are lightweight, they are able to withstand anything. The frame will hold the bar stools up, too. There’s a strip of metal at the bottom of the stools that will stop them from wobbling or collapsing. While the wicker is strong, it’s not flat enough for a table top. To ensure that drinks don’t topple and decorations can sit undisturbed, the top of the bar comes with tempered glass. The top fits beautifully on top of the bar for a beautiful, stylish finish. Is this set easy to assemble? For some people, it can be difficult to assemble. You’ll need more than one person to hold the pieces while another screws them into place – especially for the bar stools. How much weight can the stools hold? They can hold a person weighing approximately 300 pounds. What is the weight of the table and stools? The entire set weighs about 130 pounds. That’s an important consideration for the place where you want to set the furniture. Your deck or rooftop might not be able to hold that plus the people. The Merax 7-Pc Rattan Wicker Patio Bar Set is a wonderful addition to your next event. It’s also fantastic for everyday entertaining. Your friends and family will take advantage of this bar and stool set for wine parties or backyard BBQs. It’s an elegant piece that will fit in no matter where you want to add it.